Still working good for over years. No problems as all! great performer! Really nice stereo only mode and does a terrific job with 5.1 DVD movies. Not a "powerhouse" but very able. Don't use this in a large room. Get a bigger HK with more power. Nice clean sound whether it's stereo only or 5.1 surround the receiver performs flawlessly! Very versitile/has provisions for all my gear. I use this in my bedroom and have DVD,MD,CD,Tape,and VHS all hooked up and the HK handles everthing wonderfully. The AVR35 is built very well unlike some other HK models. The AVR35 has adequate power for a small to medium size room for 5.1 surround. Plenty of power in two channel stereo mode. I would recommend this unit. If you can find one used in good order grab it! Tiene la excelente calidad de audio en Harman Kardon. Chrystal clear sound, Power is enough for the "Neighbours" Lot''s of configuration options. I really love this receiver, first i had some poor AC3 sound. But after some changes in the speakersetup it really was great. I did not now that the direction of the surround speakers would make that much difference. In combi with a nice active subwoofer this is real home theater. When I compare it with philips matchline it''s really THAT better. I had the same problem with the tuner which i solved by connecting the cable antenna. I never had problems with heat while it''s placed in a small cabinet. It''s hot in there but no prob''s at all. Received a "gooy buy" @ ubid.com for $105 which should have been a tip off to the quality. Extremly poor sound thru Infinity HTS20's with very little surround sound effects to choose from. DVD, CD, & Stereo sound was absolutely horrible. Had this unit hooked up for one-half day, then the unit would not power on & shot craps. So bid.com gets it back. Definately avoid the AV35 not only for it's poor performance but quality/reliability is another key issue. Why do you think there is so much reman'd Harmon/Kardon stuff on Ubid.com? Because it's crap! Harman/Kardon is definately not what it once was. Replaced it with a Yamaha.....and BAM...night & day. The Yamaha flat out gets it w/ no disappointments. Clean, clear sound. Really nice to look at. It may be low powered but it's great! Lack of inputs. Bad "Humm". I got the H/K around Dec. 99 and it is now in the shop. After using the unit for about an hour or so, it would start to "humm" or "buzz" real bad. I guess it's getting too hot but who knows. I was considering getting a small cooling fan but why should I have to? Thank god for factory warranties cause this would have been in my next garage sale! I'm hoping the thing gets fixed but if not my heart wont be broken. I don't believe the H/K name brings the same level of performance it use to. Go with a Yamaha. If anyone as had the same problems I have please let me know: jakec697@cs.com. Clear, crisp sound... Eye-candy design. this is my first 'surround sound' receiver... previously i had only used stereo receivers. Well I've been using this amazing good receiver and I'm very happy with it if you imagine I bought it for $300! and service charges in the industry. When you buy a high end product you expect it to perform and last as well. 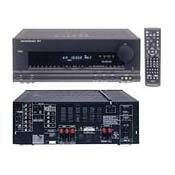 people to consider reliability before picking up a receiver.